All are brought to the Spinnery to be made into yarn. 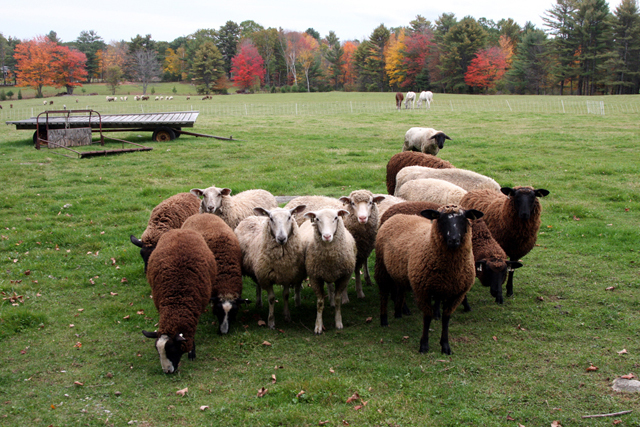 Most of the wool we use is natural colored. 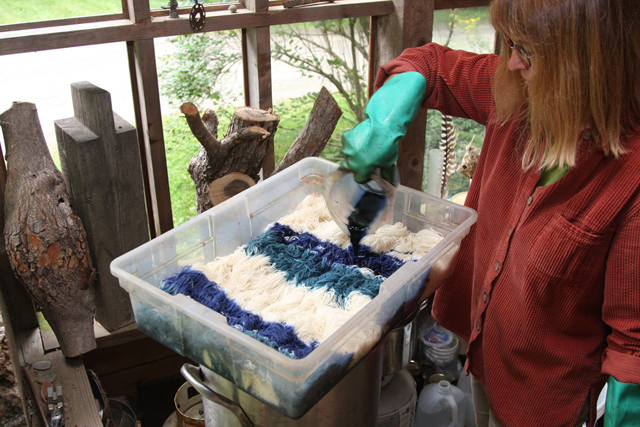 Some of our fibers are “dyed in the wool” before spinning. The fiber is sorted before washing. Our washing system is environmentally friendly. 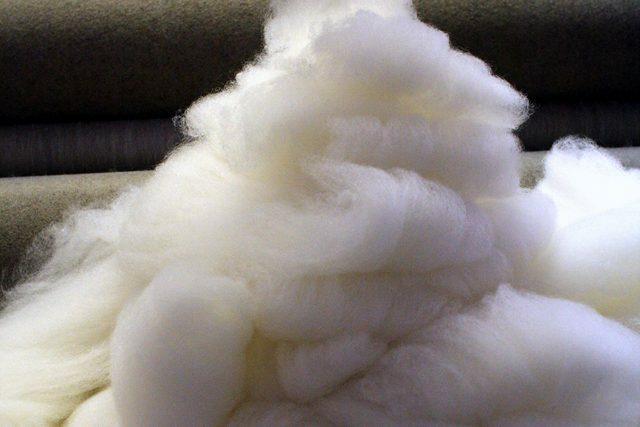 Washed fleece comes out of the dryer soft and fluffy. Each yarn is made according to a specific recipe. The fibers are first blended in the picker. 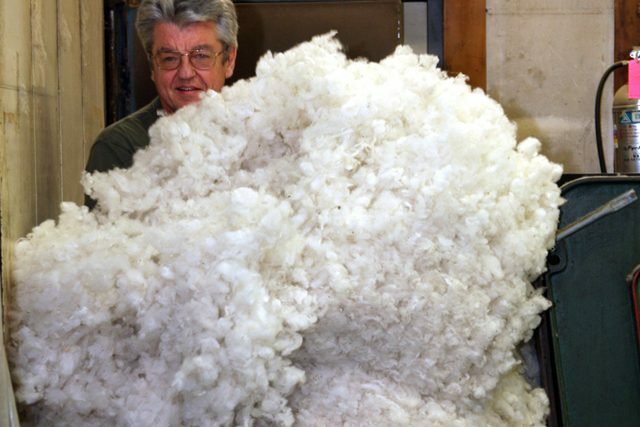 Fibers are picked several times. Spinning oil is added to the fibers during the last picking. The fiber is then loaded into the carding machine. The fiber is then loaded into the carding machine. 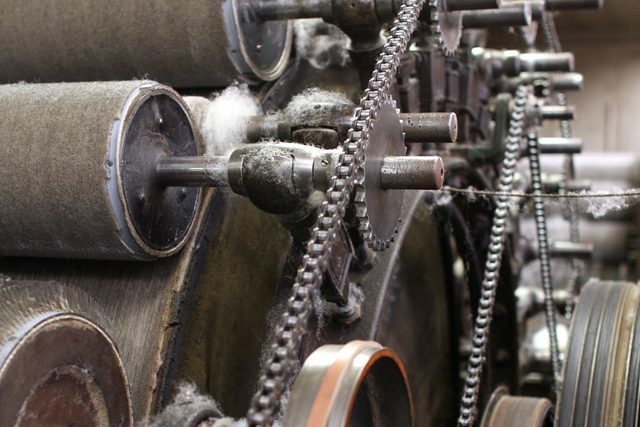 The carder has been working since 1916. The batt is then condensed into pencil roving. 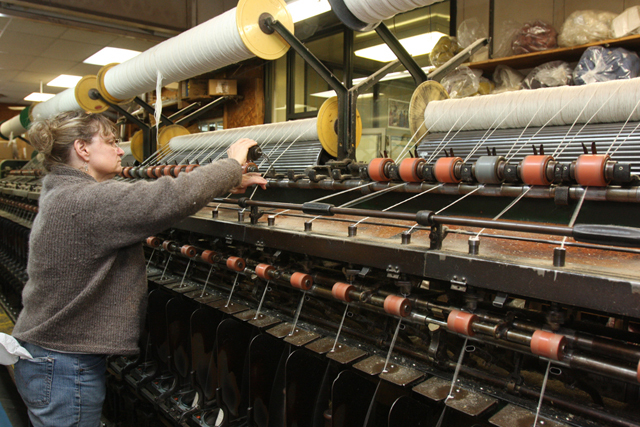 The roving is threaded by hand on the spinning frame. Full bobbins go to the steam box. Bobbins await plying and skeining in the finishing area. Multi-ply yarns are threaded on the plyer. Yarn is wound in to skeins. 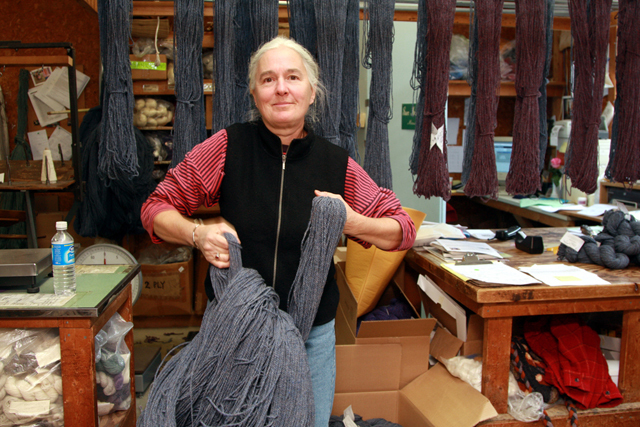 Most of our yarns are washed before sale. Skeins are then inspected and twisted. The yarn is packed for shipping or sale. Sock yarns are dyed in small batches before sale. The design team works create stylish new patterns . 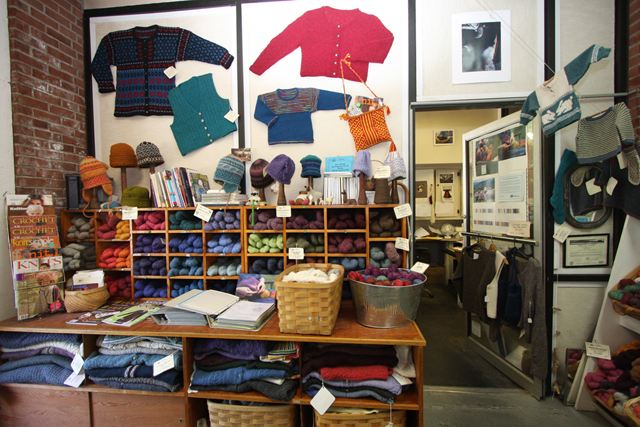 Spinnery shop is small but is a Mecca for “yarniacs”. 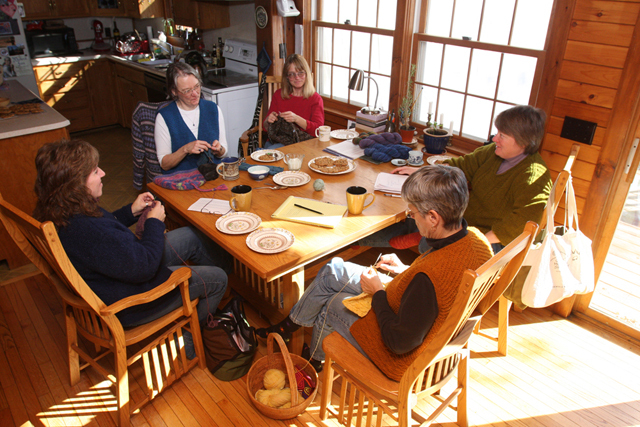 Green Mountain Spinnery has become a destination for knitters. What they find is the unexpected. 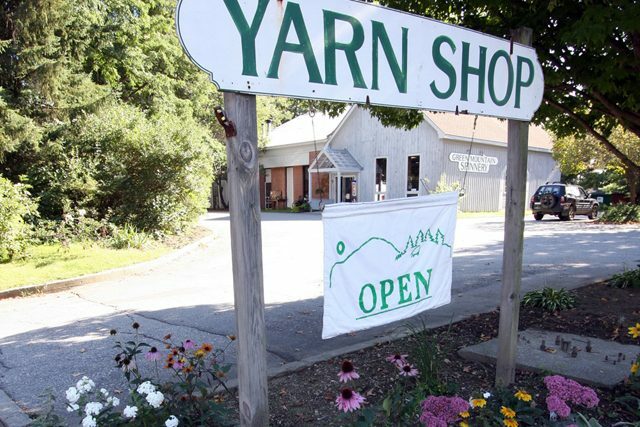 Our yarn mill is cobbled together from a group of antique machines and new technology wedged into a building converted from an old gas station at the off ramp of I-91 in Putney Vermont. 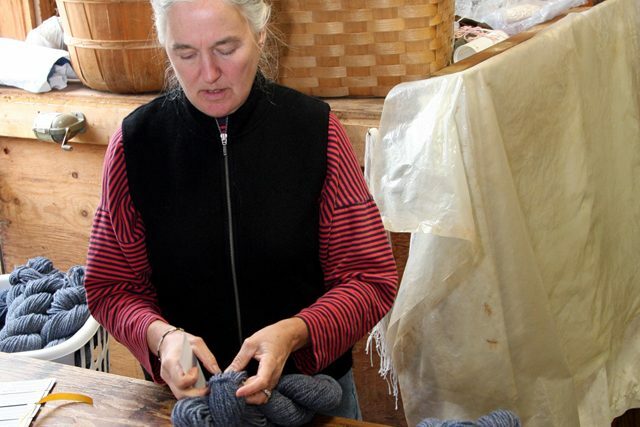 We make thousands of pounds of yarn each year for individual farmers, yarn shops and knitters. The space is small, hot, and often loud. The work is hard but it is so rewarding. There is nothing like seeing the raw fleeces washed to fluffy softness, blended to magical colors, and spun to yarns you want to touch and wear. 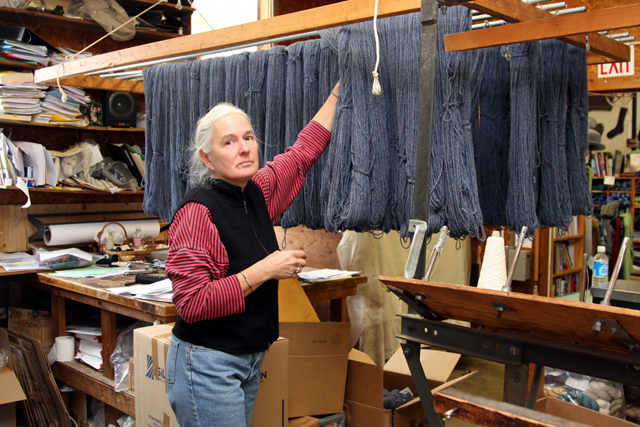 We use only North American-grown fibers for our yarns, focusing on fiber grown in New England. 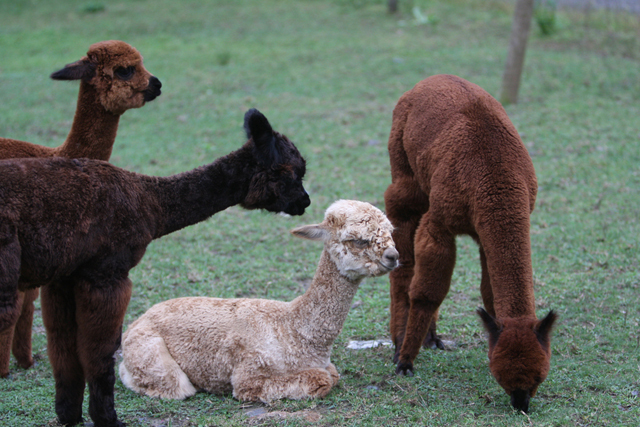 We care about supporting local farmers, so we buy as much high quality, locally grown fiber as possible. 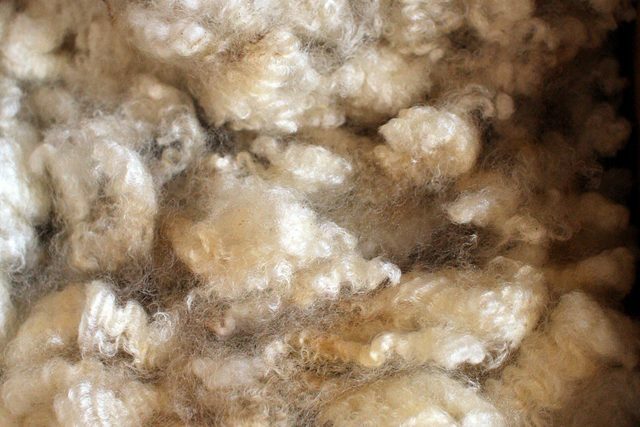 Since our fiber needs are greater than the local supply we also purchase wool and mohair from as far away as New Mexico and Montana. We offer all of our suppliers a fair price for their products. We are committed to finding ways to use our natural resources wisely and this is reflected in our manufacturing processes. 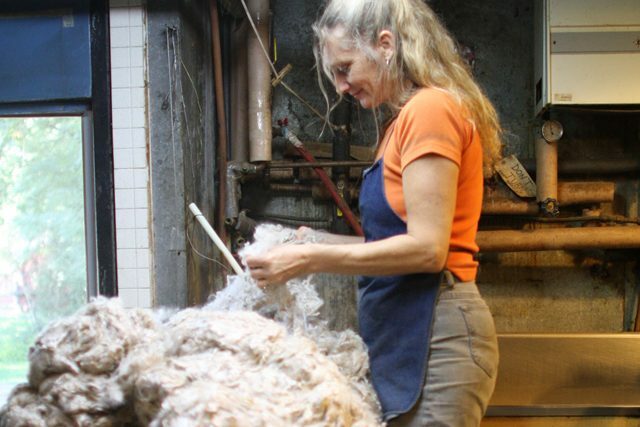 Green Mountain Spinnery is one of the few Certified Organic wool mills in the United States. 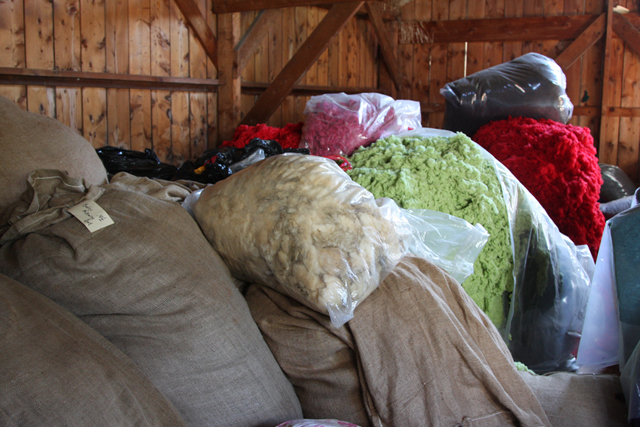 Our yarns are not processed with harsh chemicals and retain the natural qualities of the fibers they are made of. We have developed innovative ways to deal with our waste products including recycling. We hope that you can visit us in person for a tour of our facilities. Give us a call at 800-321-9665 to find out more details. For those of you who would prefer “armchair tour” from the comfort of home, here is a bit of information about the Spinnery and our process. 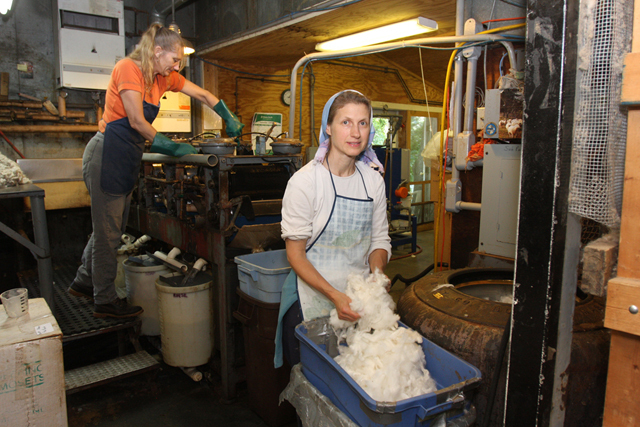 Scouring is the washing process that removes lanolin and dirt from wool. Fiber is soaked in a large sink in very hot soapy water. After soaking, the fiber is moved through a series of hot water basins until it is clean. The wet fiber is then placed in the “extractor”. This machine is the oldest in the mill, built in 1896. It is the “Spin Cycle” of the washing plant. While the drum spins, very hot clean water is sprayed on the fiber as a final rinse. Once that water is spun out the clean fiber is put into an industrial dryer. Our filtration system prevents most of the greasy wool-washing water from being discharged into the local sewage treatment plant. It also allows the mill to use the same washing water for several days resulting in less environmental impact. Picking opens and blends the fibers. 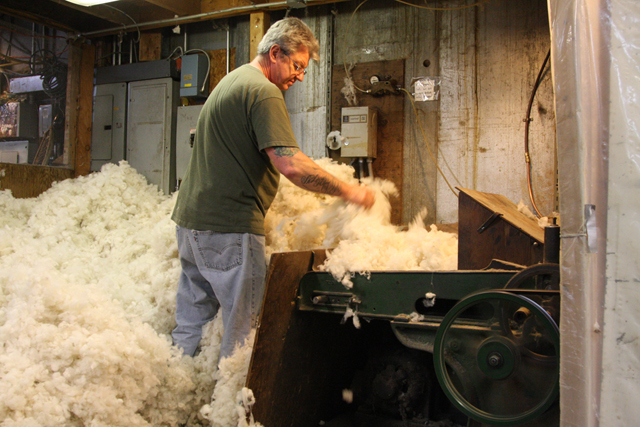 The wool is picked 2 or 3 times with the final picking lightly sprayed with spinning oil. Spinning oil is a blend of water, oil, soap and citric acid. It moistens the fibers, allowing them to flow through the processing machines more easily. The moisture also keeps static electricity from building up in the fibers, which might cause them to clump together and jam the machines. The oil mix for the Spinnery’s petroleum free GREENSPUN and Certified Organic processes contains canola oil. The main body of the Davis and Furber carder dates from 1916. 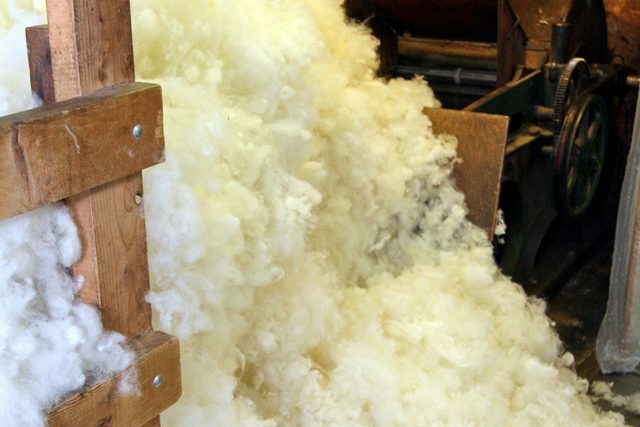 The picked fiber is added to the feeder, then a series of rotating drums blends the fibers, producing a soft lofty batt that is then separated into 4 rolls, each with 24 pencil roving ends. Although the roving looks like yarn it has no twist. 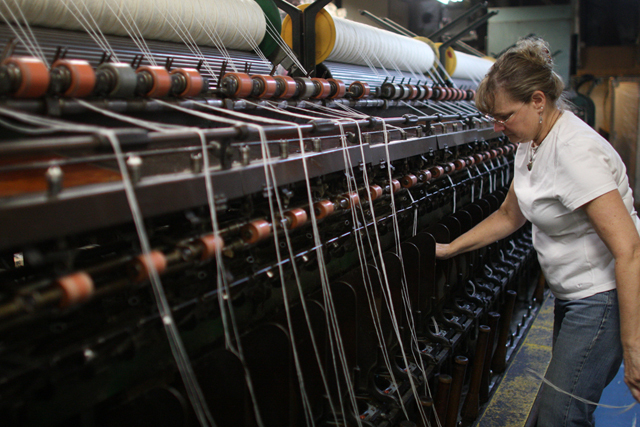 The full rolls are then carried to the 1951 Whiten Model E spinning frame where the 96 ends are threaded by hand. The thickness of the yarn is regulated several ways. 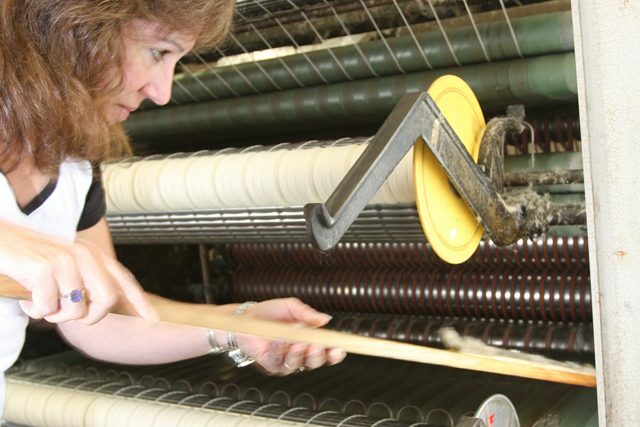 The card can be adjusted to make a thicker or thinner roving, but the most control comes on the spinning frame where the number of strands of roving spun together and the drafting tension are determined. 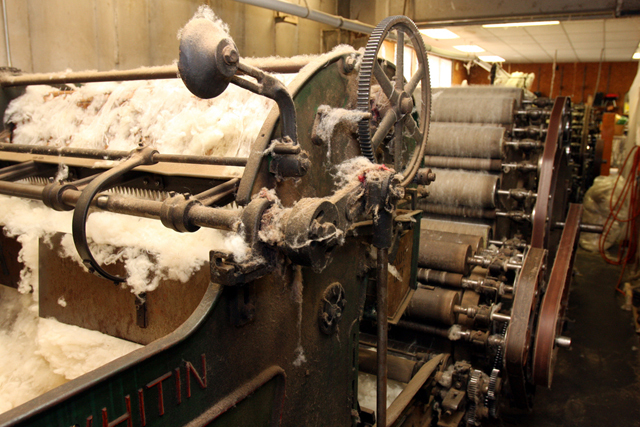 Freshly spun yarn is placed in our steam box for 2-3 hours. After steaming, yarn may be threaded on the plying machine, another 1940s era Whiten frame that has been cut down to fit in our limited space. The plyer twists the yarn in the opposite direction than it has been spun. 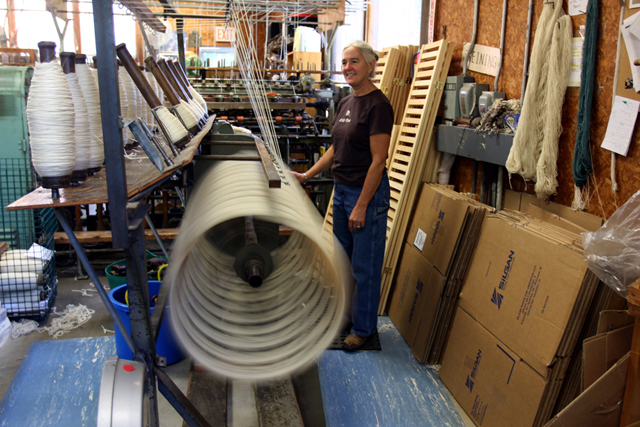 Most of the plied yarn the Spinnery makes is 2-ply, but 3- and 4- ply yarns are also produced. Varying the number of plies is another way to control the thickness of yarns. 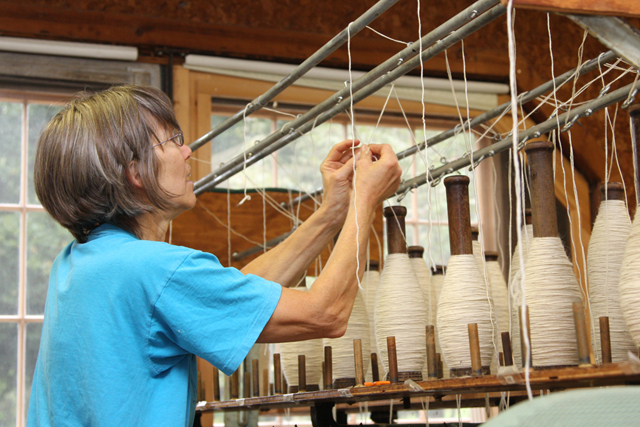 Steamed and plied yarns then go to the finishing department where they are skeined or wound onto cones. Yarns that will be sold to yarn shops and the general public are then washed, twisted, and labeled by hand. 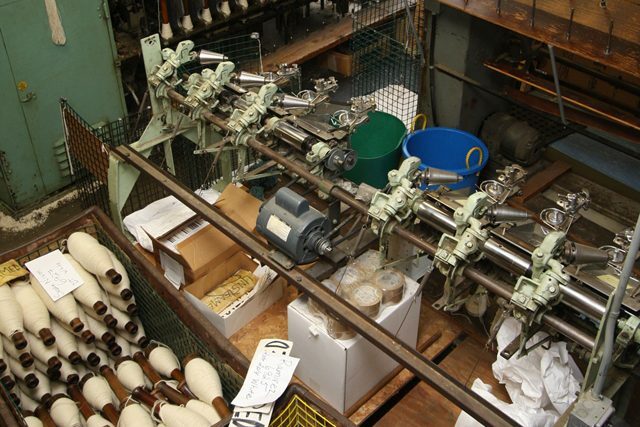 The skeining, twisting and labeling stages are labor intensive but they allow Spinnery staff to see and feel the yarn and do final quality control. Yarns that do not meet specific standards are sold at a discount in the mill shop and during special sales in spring and winter.